← Sometimes You Own the Trail, Sometimes The Trail Owns You! 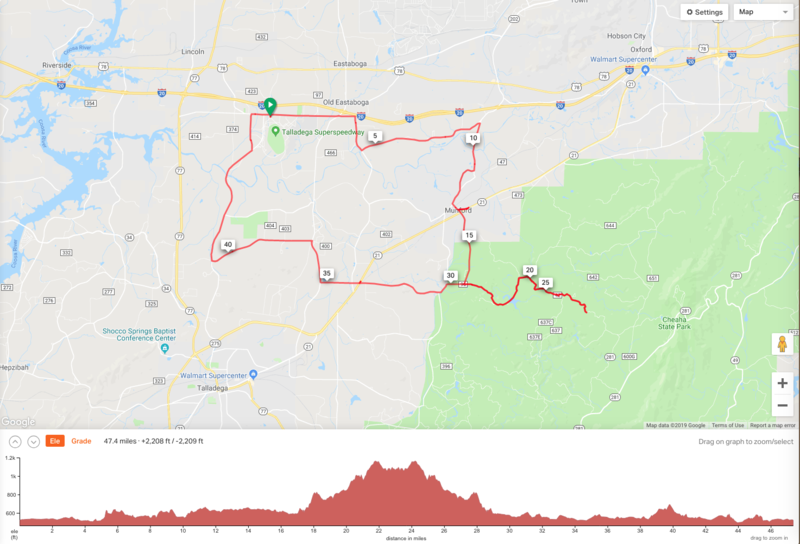 Our first major cycling event for the year was planned to be the 3-day Alabama Tandem Weekend (ATW) in Pell City, Alabama, on 12-14 April. However, due to a variety of issues our 3-days of riding was reduced to a single day ride on Friday before heading back home on Saturday morning. There were a variety of factors led to our decision to pass on Saturday and Sunday’s activities but we were thankful to our hosts for getting at least one great day of riding and social activity on Friday. To be quite honest, we’ve not been able to get in a lot of cycling during 2019. We’ve had a very cold and damp winter and spring and Debbie’s threshold for riding in cold weather has crept up from the 40’s in the late 90’s to the mid-60’s… provided the sun is out. 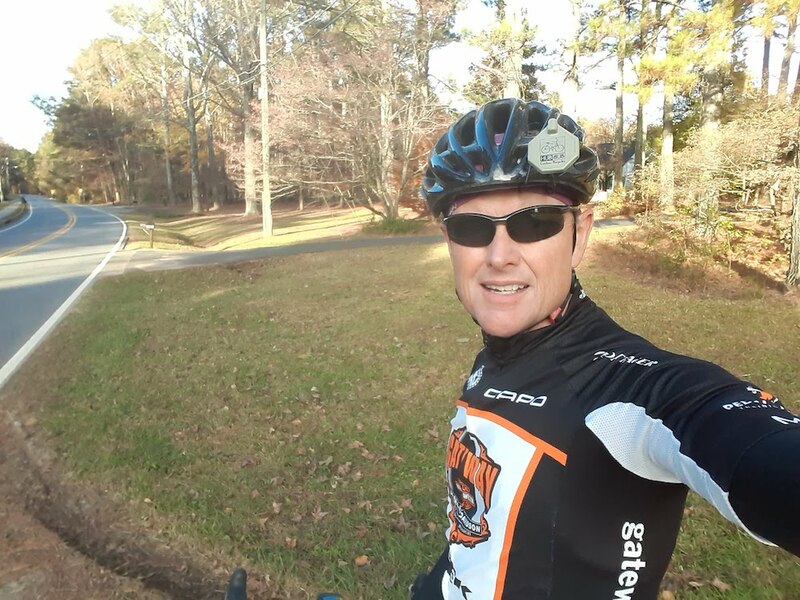 Therefore, as I did on the Tuesday leading up to ATW, I took advantage of a beautiful but cool day by heading out alone on a single bike for a 25-mile ride from the house while Debbie opted to stay indoors and exercise. It was a good ride, but not a great ride. I felt a bit tired and in retrospect, it was likely the pollen count of 7,000 I was struggling with. 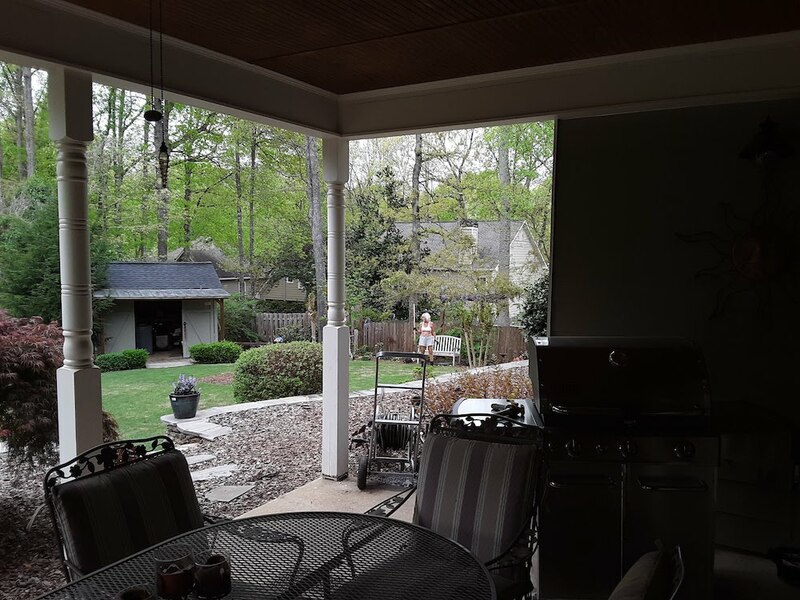 Back at the house after my ride I re-checked the weather for the tandem weekend over in Pell City, Alabama, and it was not looking all that great… especially for Sunday. With that in mind I kept my fingers crossed Friday & Saturday’s weather will still be dry enough to allow us to get at least one or two days of riding. I had until 4:00pm on Thursday to cancel our room at the Holiday Inn Express, noting that I neglected to book early enough to secure a room next door at the Hampton Inn, the host hotel for ATW. 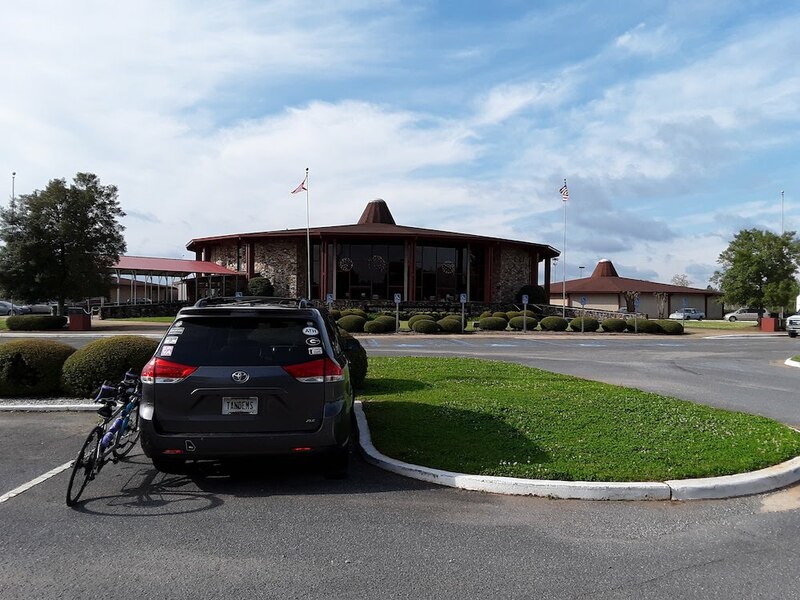 My back-up plan for inclement weather was to keep our room and head over on Friday even if it was raining and tour the Talladega International Motorsports Hall of Fame adjacent to the Super Speedway, visit with our tandem friends and then ride if and when the weather allowed. If Saturday became a wash-out as well, we’ll visit the Barber Motorsports Museum and head home early. On Wednesday the only prep work I needed to perform on our now 11-year old Calfee tandem before ATW was to switch-out the 25mm wide Vredestein Fortezza tires for a set of 28mm wide Schwalbe Durano tires as I’m reminded the roads in Alabama are often times not in great shape and often times paved using chip-seal. The last thing you want to do is to try to ride a narrow, high-pressure tire on rugged roads if you’re hoping to enjoy any part of the ride, so fitting the widest tire that will fit in your frame and running it at 85-95 psi will go a long way towards allowing your tire to deform as it passes over the rough pavement. I’d actually bought the 28mm Schwalbe Durano tires for our triplet as the tires on it are now 7-years old and likely over-due for replacement, so good I had them available as I’m not sure a set of 28mm Continental Gatorskin tires would have sufficient clearance around our Calfee’s True Temper Alpha Q fork, noting the Schwalbe tires tend to run a bit more narrow than their cited dimension: the Schwalbe’s were a perfect fit. On Thursday as we watched the weather outlook we decided to stay on plan for our trip over to the Alabama tandem rally on Friday & Saturday, come rain or shine. 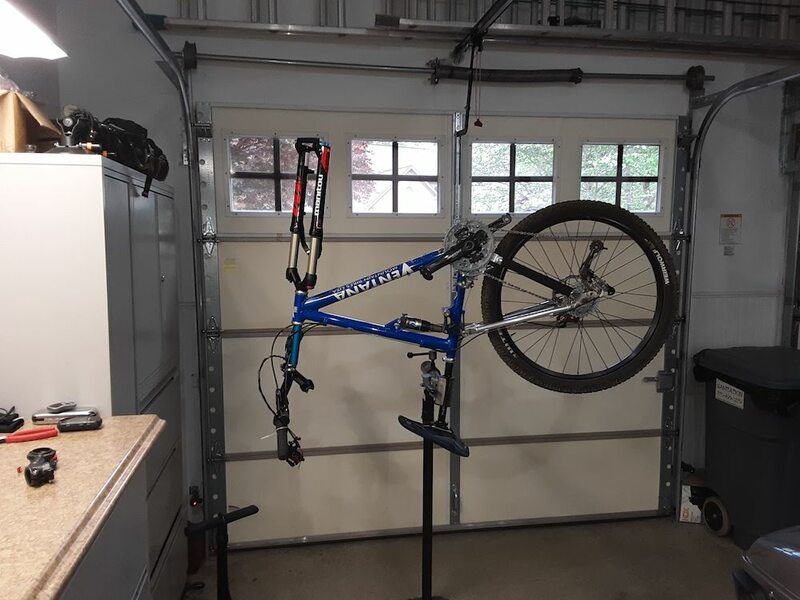 With that decision made, I went ahead and packed my cycling-related work stand and tools into the truck, followed by the tandem on the new transportation fixture. It’s a bit of a different arrangement than the one I used in the Tundra given the Tacoma’s bed is quite a bit smaller. But, by changing where I put the tools I’ve been able to free up space for our luggage and the net effect is we’re still able to put all of our luggage and equipment in the Tacoma’s bed, so that’s a good thing. We were up and on the road by 7:30am Eastern time which would put us at the Talladega Speedway where Friday’s ride would start and end by 8:30am Central time. We had a bit of traffic close to home given all the school buses and parents taking kids to school, but it was otherwise an easy drive. We were in and out of rain most of the way through Georgia, but as soon as we reached Alabama the skies began to clear. 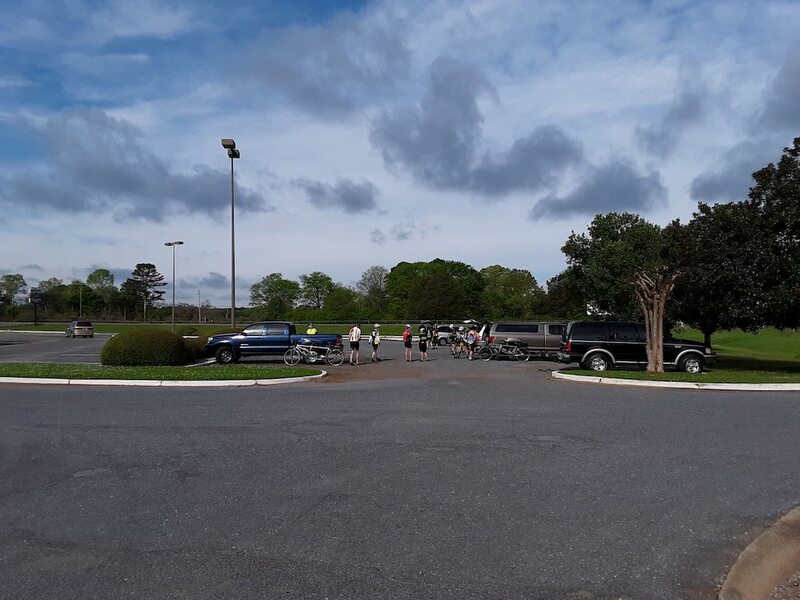 We arrived at 8:30am per plan and found our long-time friends and frequent tandem riding partners Roger & Eve as well as another 15 or so tandem teams milling about in the parking lot of the Talladega International Motorsports Museum. Other folks whom we’ve known for many years — Paul & Jody, Steve & Eva, Ron & Sheri — were on hand along with Jack & Susan from Tandems Limited in Birmingham who were hosting this year’s Alabama Tandem Weekend. The weather was now ideal, with temperatures in the upper 60’s, blue skies, a warm sun and a moderate breeze. After a rider’s meeting at 9:00am, we rolled out for the start of the ride around 9:15am and paired-up with Roger & Eve for the 47-mile route. It was really nice being back together with them on the tandems as we ride at a very similar pace. The ride had a bit more climbing than I’d expected, but the roads were as rough as I remembered so good that I’d put the larger, more forgiving tires on our tandem. We made one store stop about 37 miles into the ride where two other couples who were on one of the shorter routes had stopped and had a nice time visiting with them, noting they and just about anyone else who rides a tandem and lives East of the Mississippi River know Roger & Eve as the long-time co-directors of the Georgia Tandem Rally. 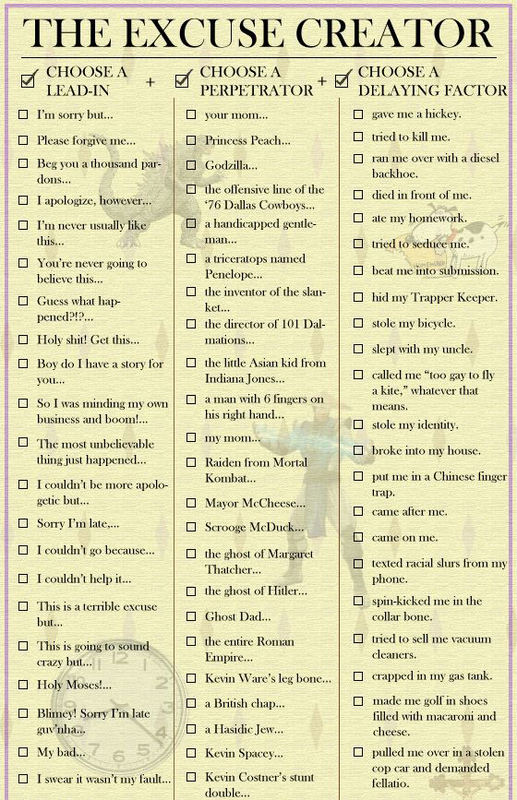 Thankfully, I’ve drifted back into relative obscurity since I’m no longer as active on the tandem discussion forums as I’d been in the 90’s and 2000’s. We arrived back at the Talladega Speedway shortly after noon where only a few of the tandem teams were still lingering or rolling back in from their respective rides, the assumption being teams who opted for the shorter routes had already gone on to lunch. It felt good to get out and ride the longer distance at the harder pace, but the pollen had played havoc with my respiratory system. 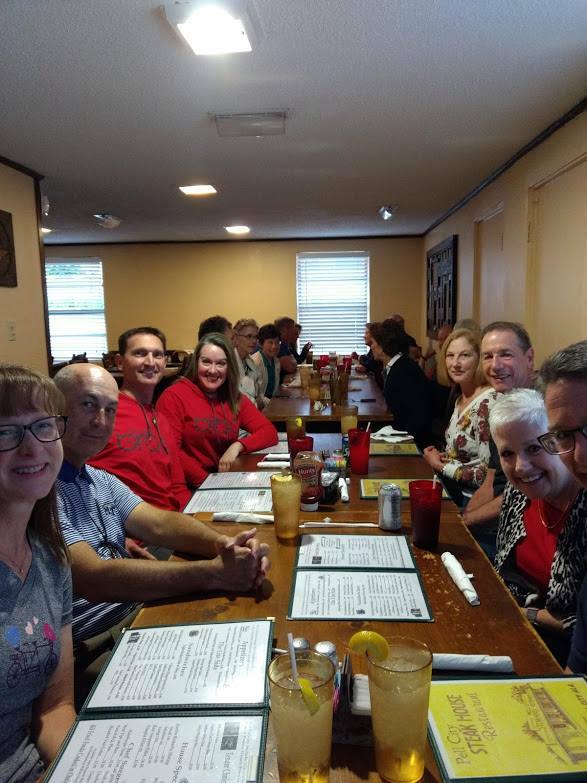 We had lunch with Roger & Eve at the The Golden Rule, a BBQ place just a 1/4 mile from our hotels in Pell City. 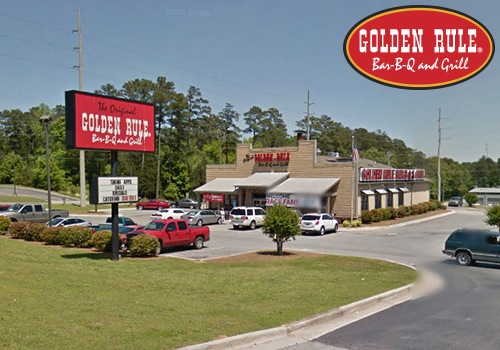 The Golden Rule is apparently an Alabama institution with 7 locations in addition to Irondale, Alabama, where it all started in 1891. It was a very nice restaurant with a great menu and lots of meal options. Debbie opted for the pulled-pork BBQ sandwich and I had ribs on my mind and ended-up ordering a platter. While Debbie’s sandwich was very good, the ribs… not so much. They were over-cooked, over-sauced and underwhelming. But, we had great company so all said and done, we had a great time at lunch. We were able to check-in early at the Holiday Inn Express around 2:30pm and initially thought we had a great room located just off the lobby. Yeah, well… I should have thought about that as we got to hear every guest come and go through the lobby and our bedroom wall backed-up to the elevator so we also listened to that all day and all night. My bad for not requesting a room change, but this wasn’t readily apparent until we were settled-in. After getting showers and relaxing a bit we went next door to the Hampton Inn where the balance of the folks who were attending the tandem weekend were staying. We found Jack & Susan and Ron & Shari in the lounge area chatting. 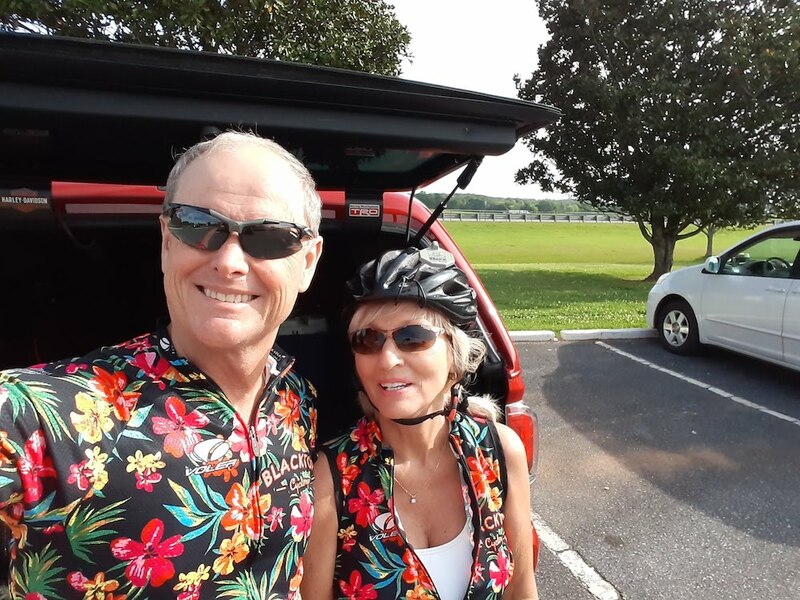 We joined them and enjoyed hearing about their various past and future travels around the world, kids, grandkids and the other things seasoned cyclists like ourselves who now make up the vast majority of couples who attend tandem rally get to enjoy as we move from the working world into post-working life. Several other couples began to gather in the lounge and around 5:30pm we all headed off en mass to the Pell City Steakhouse for dinner. 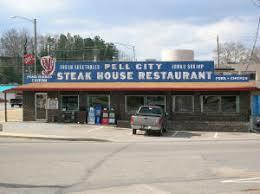 There were a total of 12 couples who made their way to the Pell City Steakhouse, an iconic southern meat & three type restaurant that first opened in 1948 and probably hasn’t changed much since then. It seats a total of 175 guests, noting we were seated in the rear dining area by ourselves. They serve no alcohol and offer comfort food, including surf and turf, salads, amazing deserts. We had a great time visiting with old friends and meeting a few new ones. The Pell City Steakhouse also did not disappoint. The one gentleman who was taking care of us did an amazing job of quickly taking our drink and then food orders and kept everything flowing throughout our meal. The food was very good and plentiful which is nice given how many of the folks at dinner are like us and split their entrees. Note: Pell City Steakhouse photos by Jack Goertz. 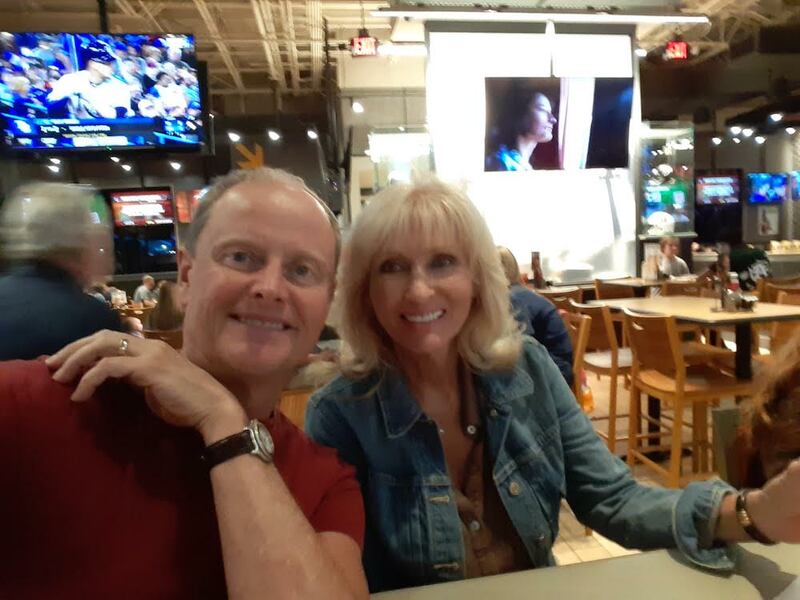 We stopped at a Buffalo Wild Wing bar and grille on the way back to our hotel for a cocktail to end our evening, noting the time zone change had us a bit screwed up. We watched the end of the NASCAR Infinity Series race on one screen, the NHL Stanley Cup Playoffs on another and the Braves vs. the Mets on yet another screen while revisiting the day and talking about our plans for Saturday. The gal taking care of us was great and we had fun with a couple of the other guests at the bar who were also watching the ballgame. It was a good way to end a long, enjoyable day. For a variety of reasons, neither Debbie nor I got much sleep on Friday night. I had not been feeling good on Thursday night and ended up sleeping 10 hours, which is very unusual for me. We probably went to bed too early given the time-zone change. There was, as mentioned, a lot of noise coming from the hotel lobby as guests came and went and the elevator ran non-stop. I was struggling with allergy issues and congested and the bed / room just wasn’t comfortable. We struggled to find the right temperature all night long and, again… Bottom Line: I’m not sure either one of us were able to get a hour’s worth of sleep. We finally gave up on attempting to sleep around 5:30am and began to consider our options for the day. A look out the window suggested rain was in our future and a check of the weather outlook confirmed that. At best, it would be noon-time before the roads might be dry for an afternoon ride and Sunday’s forecast was still calling for severe weather. I was still struggling with my allergies and both Debbie and I were nursing sore sit-bones from Friday’s ride with all of its climbing. I didn’t do myself any favors by continuing to wear cycling shorts that are a bit too large and also losing their elasticity which had me sliding around on my saddle on those long climbs and Debbie just didn’t have a lot of saddle time. So, the prospect of getting back on the bike, being tired, me struggling with allergies and not even being able to start our ride until at least noon caused us to pull the plug on our weekend of cycling at 6:00am while we were having breakfast in the hotel lobby. We sent a text to Jack to thank him for the great day of riding and dinner on Friday, packed our bags, checked-out of the hotel and were headed East by 7:30am just as the rain began to fall in Pell City. We were really disappointed the weekend didn’t play out the way we’d expected, but were still thankful for the good day we’d had on the bike riding with Roger & Eve on Friday and the social engagements we had throughout the rest of the day. So, all-in-all, it was still a good trip, albeit with a lot less saddle time and time with friends than we’d hoped. Back at the house we quickly jumped into other projects to fill the void. 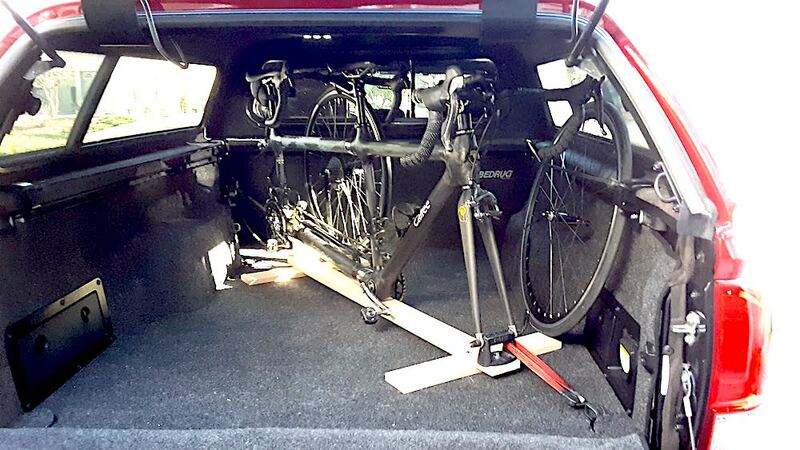 No, getting out on the tandem at home was still not an option! I need to go shopping for some new bib cycling shorts sooner rather than later! And, the pollen counts are still high to very high with something out there blowing around that’s really giving me fits.